The AB 314 sl travel alarm clock by Braun is a design by Deitrich Lubs and Dieter Rams. 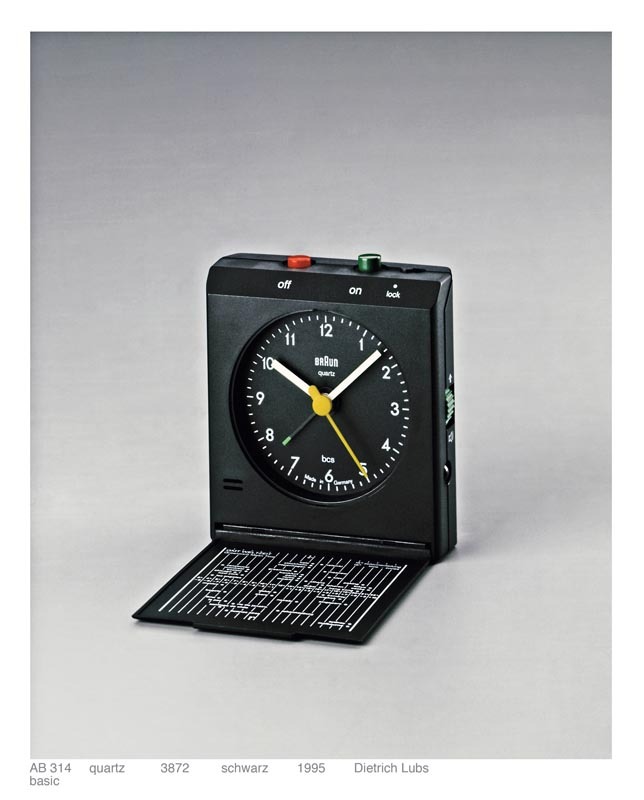 It is an elegant plastic portable clock, a product from Lub’s time as director of design for Braun in the 1980’s. It’s one of the first Braun designs I bought for myself. I had no need for its intended use; I was a teenager going nowhere, with no need to know what time zone I was in. The clock did serve a purpose apart from waking me up though; in the middle of a room quickly succumbing to the entropy of a teenager’s cleaning habits it was the promise of order and escape through travel. The clock itself is one of those post-ULM German objects that just exude rightness. Apart from minor flourishes: a chamfered shape at the top of the front face and edge of the lid covering the clock face (the Lubs designed watch I wear also shares this chamfer motif) and the soft curve shaping the back face, it is an elemental blank rectangle. The hinged protective cover has the circle of the clock face in low relief, a fractionally raised disk – as though the face were showing through. Folding down the lid reveals the clock face and a map of the world time zones. Select cities fill in for geo-political boundaries. A businessman’s world, the planet reduced to cities separated by hours without political or physical features. The choices on the map are increasingly curious to me as the years pass. Why were those particular cities chosen? Dubai –long a magnet for European consultancies – appears over more politically fraught Middle Eastern cities (Jerusalem, Mecca), with the bonus that Israel’s existence can remain conveniently un-acknowledged. My own city, Toronto, succumbs once more to invisibility as more beautiful Vancouver and more sophisticated Montreal carry the flag for Canada. China, India and Brazil all appear, though not with the cities one might chose today were the map to be redrawn. Africa is represented by cities in South Africa (at the time in the full grip of Apartheid) and Kenya, Ghana and Senegal. The selected cities are in some way a snapshot of the world worth knowing in 1980, as acknowledged (or not) by the modernist house brand Braun. This entry was tagged Braun, Deitrich Lubs, ULM. Bookmark the permalink.